Ok, most of you won't get this, but it amused me. Here's the latest on the fridge front. Yes. Strawberry. Balsamic vinegar. And black pepper. Jam. I am intensely curious. Ok - so here's what I's got! Potatoes, basil, red cabbage (size of a volleyball! ), Green Bell Peppers, yellow squash, green beans, more beets aaaaand.....Sweet Corn! I know, hard to believe there's corn already. I'm stoked. Cheese was a colby and a gouda. Mmmm..... and the standard dozen eggs of happiness. Extras from working the market - red tomatoes, a white tomato, an asian melon (smells like honeydew), and lots of peaches. And I got an armful of sunflowers. Literally a dozen stems I think. They were destined for the garbage, since many were losing petals and are generally a little "rougher" than can be sold. So they are in a vase prettying up the place. Pictures tomorrow when there's sunlight. So what have I eaten this week? Shalimar mattar paneer and Thai Smile green curry. *sigh* Tomorrow, must cook. 7:56am: Nice day at the Farmer's Market yesterday. I know you are all anxiously awaiting my report, so here you go! It was a nice heavy box this time - more new potatoes, three huge yellow onions, a few green tomatoes, one really huge deeply curved asian cucumber (yes, we made pervy jokes about that one), nice deep red round beets with greens attached, another hunk of basil, and some mustard greens from the cool refugee agricultural project. But the real score was peaches. I got five or six perfectly ripe, wonderfully fragrant peaches. I will have one on my cereal this morning for breakfast. Mmmhmmm. From my extra work I got several gorgeous heirloom tomatoes and a bunch of pickling cucumbers. I want to make myself some relish. Also grabbed a little baggie of fresh chives and some Italian roasting peppers. Oh, and one skinny little deep purple eggplant. Last week the cheese share was a gorgeous smooth Havarti and some seriously pungent blue cheese. I like the blue, although husbeast does not. :) I've been working it in little bits into things. A bit sprinkled on my scrambled eggs, a little tossed into my share of the pasta for dinner. Yum. Havarti is all gone. It did not last long at all. Delicious. So, I still have a dozen eggs, and the blue cheese that himself does not want to eat. Lots of summer squash in various forms. I'm still pondering what to do as menu items this week. I have some thoughts, but still not sure, I'm open to suggestions! The beets will likely be a lunch for me one day. Mustard/beet greens and potatoes and cornbread. Purple stir fry - I'm debating this one. I have red cabbage from last week and the eggplant from this week, so I'm thinking they'd look cool together in something. And I have lots of summer squash still that can go into a stir fry. What else sounds good with these ingredients? Oh, and lunch today - open face BLTs. Toasted English muffin, mayo, veggie bacon, Parmesan, basil and thick slices of tomato. Yum. So, a bit back rohmie mused that I was likely a fellow NT on the Myers-Briggs Type Indicator. I'll also put up a post about what I got in my CSA box and what I've been doing with it all. Here's your teaser - home made blueberry and apricot syrups. Yeah. It's been that good. Ok, since there's no news on the job front (yet another rejection email! Yippe! See how hard it is to get excited about that?) I thought I'd talk about what has been cool. Food. When my life gets out of control I tend to start cooking. This CSA is the first one who gave me a rebate with my dinner though, so I'm fond of them so far. The volunteering is going to knock a hefty percentage off my total costs by the end of the season in exchange for 2 hours a week passing out shares. Always a happy thing. And being a distributer they have a broader selection of products. In addition to the weekly box of veggies I get a pound of cheese and a dozen eggs every other week. Yum. So far the cheese has been stellar. Everything turned out delicious, and the crepes made me feel like a Real Chef. Next time I might even remember to take pictures! 3:03am: Just a random post to let you know I'm alive. I seem to be back on the insomnia kick, or maybe it's just my preferred sleep schedule reasserting itself now that the alarm clock is optional. As in, yes, it is 3 am and my body shows no signs of being ready for sleep. I did the same thing last night/morning, and slept until about 11:30am today. I need to not do this, since it will make it that much harder when the alarm clock re-establishes itself as cruel master. No job yet, but I have been told in no uncertain terms that recent graduates have three months before they become unemployed. I'll accept the transition time with gratitude and grace. I am looking, I have a fair number of apps out, and about three versions of a semi-targeted resume that can be tweaked as needed for specific jobs. If nothing pans out soon I'll pick up some temp work or something just to keep the house running. Data entry may not be the most intellectually engaging activity, but it does pay the bills and gives me time to scheme on other things. You are looking at one of three holders of a Master's degree in Bioethics and Medical Humanities from UofL , first graduating class. ETA: You know, I think I know the next thing I want to work on, school-wise. Not immediately, mind you, but eventually I want to get certified in mediation/negotiation as well. I think that fits in well with my interests in clinical ethics consulting and project management. Done! Done! Done! Done! Final paper is winging it's way through email and everything. Now I sit and wait for grades and graduation. And hope there's no rewriting to be done. I am seriously thinking about taking myself out for dinner. Now I want one, because I can see soooooo many possibilities. I know, I know, you don't believe me. But I did. which is going to end up as a beaded scarf for Jess' wedding. I started off with one bobbin because I thought I was going to chain ply the fiber. 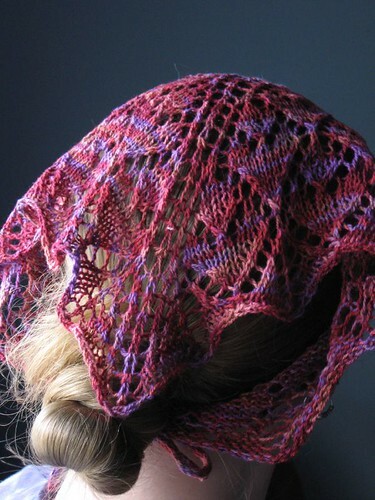 But lace is better knitted with a two ply yarn. 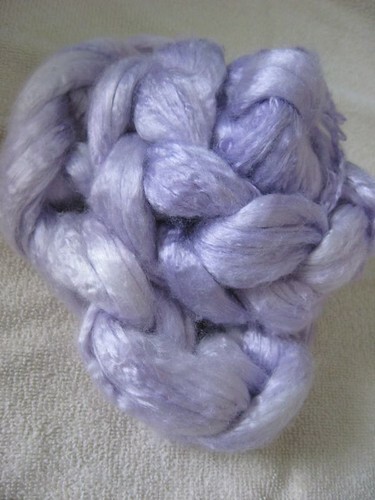 It's hard to make a two ply yarn from a single bobbin. 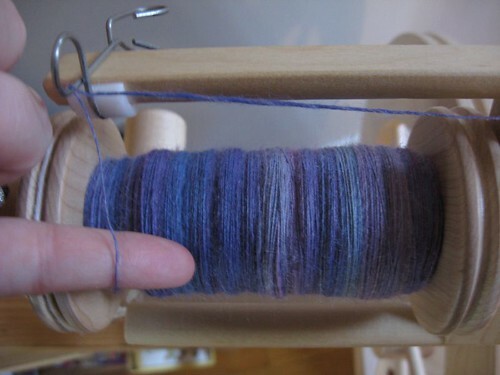 But, it's very easy to make a two ply yarn from two different bobbins. 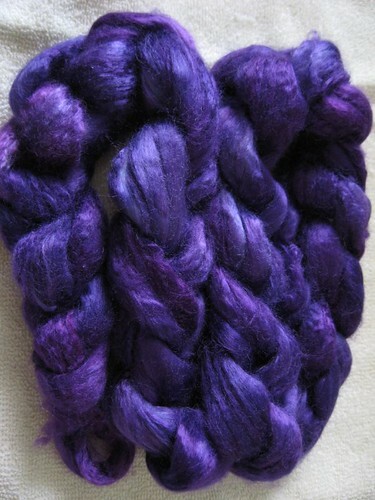 And if the second bobbin has a lovely shiny bamboo, in just the right shade of purple to coordinate with the outfit? Yeah. That should work. Now I just have to finish spinning the silk from hell first. I've also been designing a moebius neck warmer for a spring fiber club from natrlobsessions and refining my Easter Egg shawl pattern for the same purpose. Yes, two of my patterns are being used for a fiber club. This, my friends, is cool. I'm continuing test knitting. I finished Beware - The Kraken! and he is adorable beyond all words. I need to get some finished pics of him. And I'm working on a lace tank top. I also need to get pics of it. Other projects such as Grandma's blanket and my Adamas lace shawl are languishing in the land of no deadlines. Time is finite and I really do like sleeping. Which brings us to school. This is the coolest, busiest semester I've had yet. I'm doing an independent study with the Palliative Care team and the Ethics Committee. My project for the semester is revising the Do Not Attempt Resuscitation and Care of the Dying Patient policies. My updates will be reviewed by the committee on Wednesday. I'm pretty excited to see what they have to say. I never thought I'd say this, but I kind of miss the project management. Keep your fingers crossed for me that a particularly interesting job opportunity pans out as well. Other classes this semester are boring, but only in comparison to following around the Palliative Care team every week. Sitting and discussing the multiple influences on health insurance risk management just doesn't thrill me as much as seeing their chaplain explain to someone that her husband is dying, or listening to their psychologist discuss the comparison between surgery wound and phantom limb pain with a patient. I know they both are "real" but only one is concrete. I'm always drawn to the sensual, and while this isn't always pretty (nor does it usually smell all that good, alas) I'm really enjoying this. If I can just keep focused this semester I'll think I'll come through, and I'll have really accomplished something. Just some fun images from my drive home today. When I got off the expressway and turned down the first street of my path towards home there was a guy carrying four balloons, two black and two red, with a weight wrapped in foil at the bottom of the ribbons. Plain rubber balloons, oblong, nothing fancy. But he was walking along like it was the happiest day of his life, swinging the weight beside himself in time with his steps. I noticed his hat bill tipping back occasionally, so he must have been looking at the sky. His movements were so carefree and relaxed, what we would call childlike, unrestrained. I got to the corner where I turn right and there was another man standing there, a printed banner with "Happy Valentine's Day" in his hands. He stared at the people in the cars directly, almost challengingly. Have a great Valentine's day, I DARE YOU! There was a dissonance between his face and his message, and even though I smiled at him, he never made eye contact with me, even when I was the first car at the red light, waiting for my turn. I was thinking about blowing him a kiss or some other acknowledgment, but he started walking down the line of paused traffic instead. As I turned I wondered what his motive was. If it was love, why stand there after it was obviously no fun anymore? There was no affiliation markings that I saw on him or on the sign, so why do it other than love? I wondered what had just happened to him, how long he was standing there, what motivated him to print a sign wishing everyone more love in their life - or if Valentine's day means something totally different to him. I've decided this is one of the reasons memory fails - too much information. I've only glancingly recorded what I noticed, there was so much more to say. Details of dress, posture, expression, the angle of light, the temperature outside, the time of day. But even the fact that today I passed a man holding a sign wishing me a happy Valentine's day will be lost and forgotten, only brought to mind if something relevant sparks the memory. There's too much information for my brain to hold on to it all, so I forget. I suspect that as I layer day after day of experience onto my life it will get progressively worse. And yet I don't know how or if I should stop it. Of course I can journal more, which is a selective form of memory. I could photodocument everything, but that gets in the way of experiencing. So for now I think I can accept that this is the best solution - enjoy and forget to make room for new enjoyable experiences. One of the things I love most about reading is how the author's voice shapes my own. Right now I'm reading Pattern Recognition by William Gibson. So I find myself thinking in lush imagery, staccato sentences, walking through my house as if there is an invisible narrator slinking along behind me. It's most amusing when the style collides with reality - when I do something I can't ever picture a Gibson character doing. I've never run into a single one who enjoys cooking the way I do, for example. None of his characters seem the type who gets lost in the smell of simmering lentils, or roasting butternut squash. Who delights when sticky grapefruit juice runs over her fingers, and licks each one clean. For all his depth of image, he still works within a very sterile dystopian field - his people, his world, seem to lack a sensuality that is all pervasive in mine. But then I just hear the narrator adjust, describing me in contrast to the cold, sterile a-sensual world that I would inhabit. It would probably be a form of escapism, losing myself in the smell of sauteeing garlic so that I didn't have to think for a time about the mechanization of my soul. It amuses me. So what should I read next? What should influence reality's voice? I love Imbolc. In the darkest depths of winter, it is a holiday to remind us that there are lights other than the sun. For me it means human fires - small fires that light the darkness. At the risk of being overlooked on your friends page, here's my contribution to the light. I know Brighid calls for us to be heroes, so for her sake I'll try. and so is the power. Supposedly we made it. I'm still waiting for the house to warm up before I really believe it. Lots to say, but more to do. Clean up is going to be a spectacular task, although we had some help. Two guys from the neighborhood were looking for work with their chainsaw. They made quick work of the fallen and falling limbs. I'm all good with that. I'm glad I'm watching this at home alone. Yes, the web streams have been a little sucky. And I discovered a minor household emergency exactly at noon when Obama was taking the oath. ::sigh:: So all told I have a very scattered and disjointed impression of this event. I did get to hear the poem, which is honestly my favorite part of this ritual. I love that occasionally we trot out the "American Poet" and pretend we have deep thoughts. It makes me happy. But even the little pieces I saw moved me to tears. I really want to believe. Obama is finally cracking through my political apathy. In general I find every person interested in pursuing politics as suspicious. I really do feel like running the world is one of those jobs that should never be done by someone who wants the job. If you want the job I don't trust you with it. But we have the system we have, and I'm generally good with working within existing structures. So I'll give him a chance. Ironically enough, I have to lead a class discussion tomorrow talking about why the US does not have basic healthcare coverage for all citizens. The author I'm working with feels that the American narrative of autonomy in political and economic matters is fundamentally to blame. Basically the argument goes something like this - in America everyone has the same opportunities to take care of thier needs. So if you are not taking care of your own needs you are somehow a failure - usually a moral failure (since laziness is a vice in our culture). If you are a failure then I do not need to help you. Oh, and welfare breeds dependancy, so if I want to really help you, I can't help you. Yes, I'm phrasing this in a way that makes the problems with this belief pattern really clear. But it's also an eerily accurate version of an argument I've had with many people in my life. They use nicer words, but the argument tends to come back to the same basis. We don't have health care for everyone in this country because if you don't have health insurance it's your own damm fault. Get a job. The only thing I can think about for class tomorrow is one question - is this still true? Can Obama really change scripts that have been running in this country since the Revolution? Lucky for him, he doesn't actually have to shoulder that burden. All he has to do is help us codify the changes we've already made in our own scripts. And not break anything to the point where we can't adjust in the future. Oh, and Obama, when you say that you're going to use technology to make healthcare more accessible and more affordable, I get squicky. Technology is not a solution, it is a tool. Often an expensive tool. Project managment 101 says don't put the solution before the problem statement. Just saying. Now I need to tear myself away from the news coverage and actually write this class discussion paper. It's crazy cold out there, and my body knows it. Would anyone mind if I got really, ridiculously fat? 'Cause if I keep eating like this while staying in my nice cozy house that's what is going to happen. Case in point - I went grocery shopping on Wednesday. Just a strategic strike really. And I have a pretty long standing rule - the days I shop I keep dinner simple. Like mac and cheese level of simple. I'm usually shopping right after work or school, so I'm pretty tired even before I hit the grocery store madness. So Wednesday was canned ravioli. But I was still hungry. So I a bagel with cream cheese. A few hours later, seriously hungry again, so I had cheese and crackers. Noticing a trend here? I tried to improve the nutritional profile a little with some fruit, but I couldn't stand the thought of eating just veggies (my normal go to still hungry snack). Then Thursday night I made scalloped potatoes. Four servings used four potatoes, several carrots, onions and celery stalks, fresh parsley. A little dried dill and basil, a touch of salt and a lot of pepper. So far so good. Then a cup of sour cream, a cup and a half of shredded cheese. And then four slices of veggie bacon, cooked extra crispy, crumbled on top. Delicious, and more fat than I probably need in a week. Yes, I use real sour cream, the low fat stuff tastes, well, weird. I'm still craving tuna noodle casserole. I'm just not sure how to veggiefy it. Nothing really replaces tuna. I could work in some seaweed somehow for a bit of fishy taste but somehow that seems very out of place in what is supposed to be a very simple casserole. So I'm thinking I'll pare back to the basics and see what I have - pasta noodles, cream of mushroom soup, peas. Some sort of crushed cracker crust on top. I'll up the veggies a lot - add onions, carrots, celery, bell peppers. Just the basic flavoring mix, nothing like brocolli that has its own assertive character. I want creamy and hot and well, not exactly bland, but certainly not my normal level of aggressive spicing. Simple - Take the first sentence from the first entry day of each month and post it. March - Call or drop me a line if you would enjoy celebrating my birthday with dinner tonight and I somehow otherwise forgot to tell you about it. June - I got nudged again, so I thought I'd refresh this. July - Mom and I used to always joke that we'd open an Asian fusion restaurant and call it "Happy Tummy." August - The campus fountain is back on. September - Of all the possible paths, one of us will walk each one. December - Tell me it will be ok? Mine isn't nearly as cool as dubeach's, but that's ok. Although it amuses me how many months I spend in silence. Should I go to my blog and see if there are entries there for that month? Grasshopper bars - did the white chocolate peppermint ganache and the dark chocolate ganache, in the fridge hardening. Meringue stars - which failed. I think I had the required temps reversed. I chilled the egg whites and bowl, and they refused to whip up. Some research revealed that all is supposed to be room temperature instead (it's cream that does better cold). Doh! So I pitched these. I was mostly making them to use up egg whites from other recipes which used only yolks, so no big loss. I'll make some no-bake cookies for husbeast to take to work on Wednesday closer to when they are needed. Hope everyone is staying warm, it's crazy cold out there now!